In contrast with reduced shopping, and perhaps because of it, the trends in eating differ from those of retail. 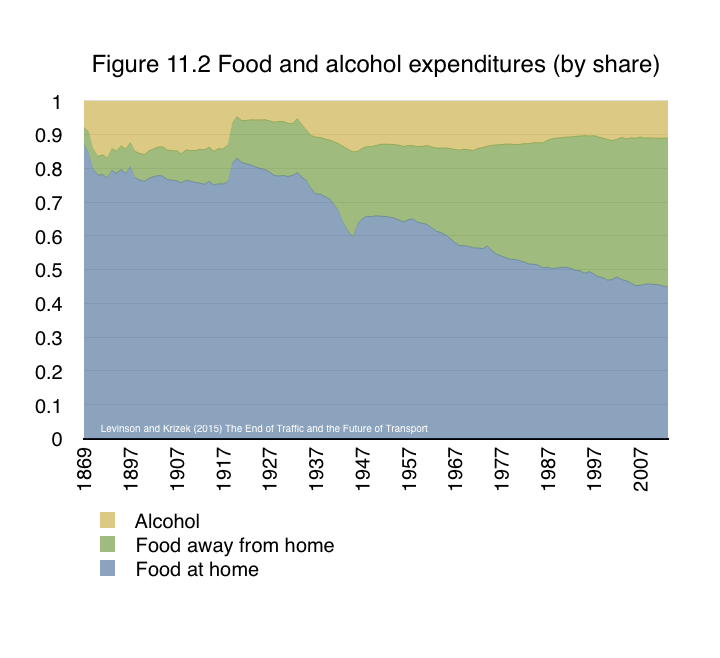 Over more than a century, eating out has eaten a larger share of the food budget, as shown in Figure 11.2. Going to restaurants is an increasingly important social activity. This is largely attributed to both efficiencies in food production and higher incomes enabling more of it to be spent on more expensive options. From Levinson and Krizek (2015) The End of Traffic and the Future of Transport. Figure 11.2 Source: USDA Economic Research Service, Table 1 . < MnPASS pricing algorithm to become a continuous function.